While you cruise the Chain O’ Lakes this summer, pause a moment to consider the ghosts of those who once traversed these lakeland waters – from Native Americans to explorers, mobsters to politicians, boaters to 1920s flappers. The area’s original inhabitants were Native Americans from the central Algonquian tribes, primarily the Miami, Mascouten and Potawatomi. The first Europeans appeared in the mid-1600s. They were French trappers and traders, including explorers Jacques Marquette and Louis Joliet. By the late 1800s the area had become a popular hunting and fishing area for wealthy Chicago sportsmen. The site now known as the Mineola Hotel was originally built in the 1880s by members of the Chicago Board of Trade as a private club for boating and fishing. In 1897 a group of powerful Chicago business leaders and politicians founded the Pistakee Yacht Club, still alive today. Starting in the 1890s, the Chain O’ Lakes began attracting weekend visitors from Chicago who boarded steamboats to view the “Egyptian Lotus” beds on many of the lakes. Moreover, famous merchants and industrialists from Chicago built Gadsby-esque summer mansions along the miles of Chain O’ Lakes shoreline. With the 1901 opening of the Milwaukee Road railway between Chicago and the Nippersink Point Station, the Chain O’ Lakes became a tourist destination for the masses (while the wealthy moved on to more exclusive locales farther north). With improved access by rail and road, resorts and cottages began crowding along the water’s edge. Dance pavilions and ice cream parlors sprung up. The steamboats filled with sightseers competed with fishing and sailing boats and – each year – more and more motor boats. Chicago mayors Big Bill Thompson and Fred Busse vacationed along the Chain, as did Illinois governors William Stratton and Otto Kerner. In 1922 some 5,000 people watched then Cook County Board President Anton Cermak, later famed mayor of Chicago, win a boat race on the lakes. The name of his boat? The City of Chicago. But, although wholesome family fun was prevalent, there were other things to do in this popular vacation spot. Gambling, booze and prostitution were big business. Lake County officials, not ignoring this lawlessness, staged raids on numerous establishments. So, in order to keep the bars going and the County vice squad at bay, in 1907 business owners around Nippersink Point incorporated as the town of Fox Lake. The new town had only 500 permanent residents, but its summer population was as large as 20,000. The town government placed few restraints on resorts within its borders and, just prior to prohibition, issued 48 liquor licenses. As prohibition became the law of the land, Fox Lake turned a blind eye toward alcohol. This permissive attitude brought in the mob. Infamous gangsters Al Capone and George “Bugs” Moran vied for control of the illegal booze and gambling business. Capone owned a summerhouse on Bluff Lake (where our Newport Cove community is located). He also was known for frequenting the popular Mineola Hotel. Legend says the Feds caught Moran, who reportedly also had a summer home on Bluff Lake, at Elizabeth Cassidy’s Bluff Lake resort. The Chain’s worst prohibition violence occurred on June 1, 1930 when three mobsters were gunned down at the Manning Hotel on Fox Lake. Occurring about a year after Chicago’s famous St. Valentine’s Day Massacre and supposedly involving the same players, this unsolved crime became known as the Fox Lake Massacre. Gangsters did not hurt tourism, but the Great Depression did. It decimated businesses around the lakes. Many hotels and restaurants closed, their heyday ended. Numbers of families, after losing their year-round homes in Chicago, permanently moved into their Chain O’ Lakes summer cottages. Developers bought up bankrupt resorts and, following World War II, many returning soldiers bought homes in the new housing developments that now claimed the land. The area evolved into suburban, middle-class communities. Some remnants of the old days remain. A few mansions and resorts survive as private homes or public buildings. The Mineola Hotel, although in disrepair, still stands and is included in the National Register of Historic Places. Then, there is Blarney Island, the self-proclaimed “greatest boating bar in the world.” In the beginning (the early 1900s), Blarney Island was a houseboat owned by Jack O’Connor and docked at the water’s edge. Across from O’Connor’s establishment was Shorty Shobin’s place. Jack and Shorty were intense competitors. Their heated feud came to a head during a game of poker. In the last hand the two men wagered their businesses, and Shorty came out on the short end. Folklore has it that Shorty left the poker table and took his life in the back room of the bar. Soon after that, Jack O’Connor’s houseboat burned down, forcing him to move Blarney Island over to Shorty’s bar. Today Blarney Island is the most famous spot on the Chain O’ Lakes and is known for what it calls “the five Bs – babes, bikinis, boats, bands and beer.” Those who come by boat to this all-bar island can tie up at its large network of docks. If you do not own a vessel, a shuttle which departs every hour from the bar’s mainland satellite location, Port O’ Blarney on Grass Lake Road, can ferry you over. If you like speed, be sure to catch the drag boat races at the Island on Thursday nights. 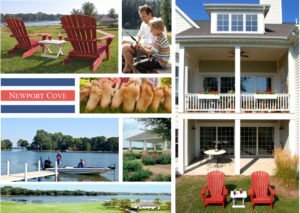 Although here we have focused on Chain O’ Lakes history and entertainment, the area offers a wide range of recreational options. With some 7,100 acres of water, 15 interconnected lakes and 45 miles of river, this self-styled “Key West of the Midwest” accommodates activities for every water-lover: canoeing, kayaking, waterskiing, tubing, fishing, swimming, even hunting and birdwatching. Complementing these activities are many local businesses, including numerous marinas and restaurants, several of which sponsor special events throughout the summer: boat shows, fishing tournaments, festivals and live music. For a quiet afternoon on the water, boaters can visit the 3,000-acre Chain O’ Lakes State Park and adjacent conservation area, or follow the Fox River out of Grass Lake and north to Wisconsin where, just a few knots above Blarney Island, you will find an area so untouched, so beautiful and so remote it seems you are back in the days of the Miami, Mascouten and Potawatomi. 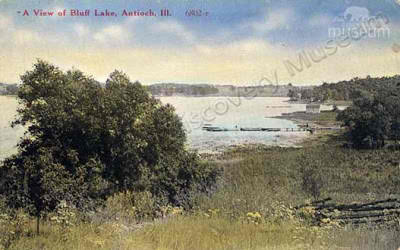 Below: From the Lake County Discovery Museum, this colored postcard shows Bluff Lake in the early 1900s. ← The Chain O’ Lakes Floats Your Boat!